Is there anything better than a homemade chocolate chip cookie? 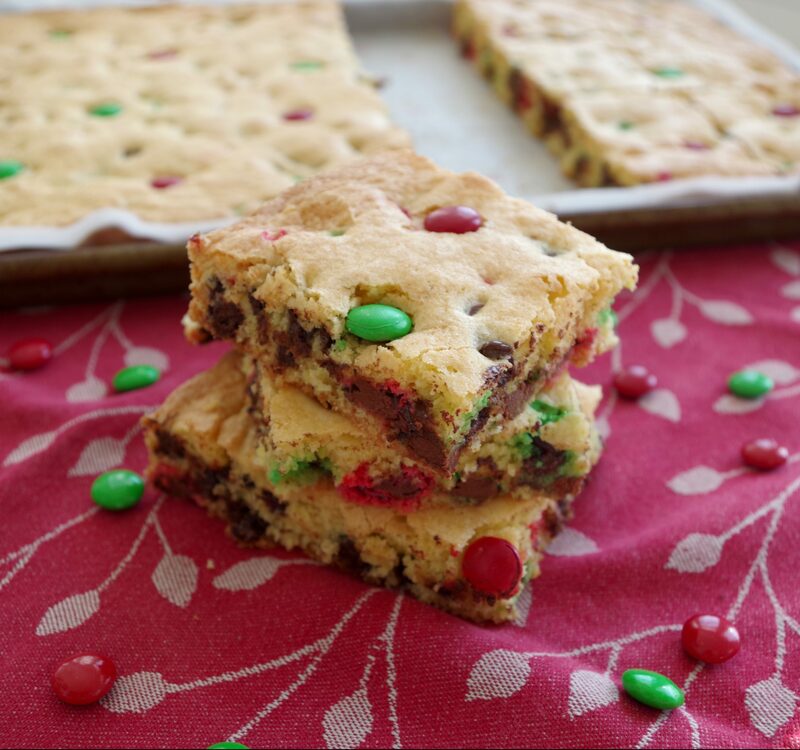 How about these easy to bake Christmas Cookie Bars filled with chocolatey goodness and Holiday M&Ms?? I adapted this recipe from my Amish Chocolate Chip Bars, which are always a hit, so I KNOW you’re going to enjoy these just as much. I love whipping up homemade treats this time of year to give to those that I love. These bars are super simple to make and taste AMAZING! Plus, you can slice them into bars and package them in a Christmas cookie tin for a quick, homemade treat. You’ve GOT to give these a try and if you like this recipe then be sure to check out my Easy Christmas Bark and my list of 15 Homemade Treats to Give at Christmas. Enjoy friends! Step 1: Preheat oven to 350. In medium mixing bowl, combine dry ingredients. Step 2: Add wet ingredients and mix well. Step 3: Add chocolate chips and M&Ms. Mix Well. Step 4: Spread parchment paper out over pan leaving extra at each end. Step 6: Sprinkle additional M&Ms on top of dough for more color. Step 7: Cut off any excess parchment paper around the edges. Bake for 25-30 minutes or until golden brown. Step 8: Let cool, cut into bars and serve. In medium mixing bowl, combine dry ingredients. Add chocolate chips and M&Ms. Mix Well. Spread parchment paper out over pan leaving extra at each end. Sprinkle additional M&Ms on top of dough for more color. Cut off any excess parchment paper around the edges. Bake for 25-30 minutes or until golden brown. Let cool, cut into bars and serve. Yum, these sound so good! I wish I had one to eat with my cup of coffee.